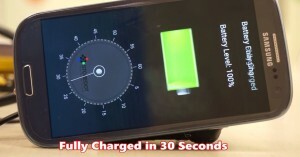 Is it possible to charge the battery of a smartphone in seconds? It seems incredible, but it could be true in the very near future. StoreDot Ltd, a Israeli company, has presented a revolutionary technology that can charge the battery of a smartphone in 30 seconds. On 7 April, Tel Aviv held the Microsoft’s symposium Think Next, dedicated to technological innovation. In this symposium participate a large number of researchers and leading companies worldwide, to show their new and revolutionary technologies. Currently, the charger is about the size of a laptop, and the battery has a volume of a pack of cigarettes, but StoreDot expects that the dimensions will have been reduced considerably by 2016, when it go on sale with an affordable price. The batteries that this company manufactures are made of nanosized biomaterials, which provide improved characteristics in both the capacity of the electrodes and electrolyte performance. StoreDot has specialized in the manufacture of different devices using these biomaterials, which seem to be a very good alternative to the current ones. In the case of batteries, the company uses nanocrystals made of peptides, the organic molecules that build the proteins. These materials are harmless to the environment, unlike the products used in the current batteries, which include heavy metals that are highly polluting and toxic, such as cadmium. This technology has applications not only to batteries, but also improves the performance of the TV screens and can produce bio-lasers, thanks to the good fluorescent properties of these organic nanocrystals. There is still a long way before we can have these batteries, but the fact that the technology is possible are a very good news for the future of the batteries, both in mobile devices and in the automotive industry.